The recession might be technically over, but these things have a long tail and there’s more misery afoot, especially once the new occupants of Downing Street start to swing their cross-party scythe. Austerity has crept back into fashion. People want – need – their money to go much, much farther than it ever has done before. Extravagance is out, frugality is in. The cookbook industry has started to catch up, with a clutch of ‘thrift’ minded titles hitting the shelves recently. Jason Atherton’s is one such book. Gourmet Food for a Fiver has a simple proposition – that it’s possible to cook a two course meal for £5 a head, and that that meal should still have a sense of culinary style and, well, a bit of glamour. My first thought was that the food was likely to be terrible, too straitjacketed by the budget…a ‘fifty ways with a cabbage’ type of thing, but that wasn’t – thankfully – the case. There’s only a single cabbage recipe here, and it actually looks quite good. Atherton wisely concentrates on using cheap ingredients, but by ‘cheap’ you mustn’t read ‘poor’. The most inexpensive and everyday of ingredients, when properly cooked, can be incredible, and this is the angle that Atherton works to his advantage. For example, mackerel is as cheap as fish can be, but it tastes delicious, especially when prepared as a tartare, lightly salted and chopped finely, served with an avocado puree and some preserved mooli. Other recipes use clever substitutions. Chicken legs respond to confitting in much the same way as duck legs, but are a third of the price, and can be cooked in vegetable oil instead of the more traditional duck or goose fat to much the same effect. When teamed with chorizo, butter beans and some roasted garlic, you’ve got rather a nice dish for not that much effort or money. It’s an inventive dish and more adventurous than you’d expect to see in a credit crunch cookbook. You may have spotted one of the flaws there. Preserved mooli? Who has that? If you want to cook that dish, you’re taking a trip to a specialist Asian food store, and you’re buying a whole jar of mooli so that you can use a few pieces to dress your mackerel. That jar will probably blow the budget to pieces, but the unit cost of the mooli you actually use will still be quite low. Technically, you’ll have cooked your meal for a fiver, but you’ll have spent a few quid stocking the cupboard, as well. The same is true of several other recipes. Great, frugal cooking, undone slightly by the need for unusual ingredients that might linger unused in a cupboard somewhere for months or years. Fifty grams of pistachio nuts, six Sichuan peppercorns, one tablespoon of flaked almonds, that sort of thing. These are all things that you might have lying around anyway – I think I could rustle up the end of a bag of almonds or something similar right now if I had to – so it’s not such a big problem, nor is it a big criticism. Keeping a good range of extra store cupboard ingredients to hand never hurt any cook, but you need to invest first. Gourmet Food for a Fiver is a great book. There are some inspirational and inventive recipes here that you should be able to put on the table for a a fiver, give or take the odd pound, if you plan carefully and shop well. 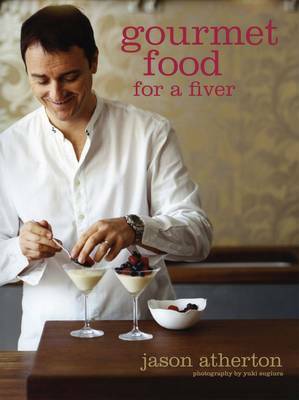 Jason Atherton’s Gourmet Food for a Fiver is published by Quadrille at £14.99.